As a financial adviser, it is our job to help you assess risk, expected return, and the costs of an investment. Before any recommendations or decisions are made, we start by having our clients take a risk survey to determine your personal risk tolerance. Risk numbers are calculated based on the amount of loss that you can tolerate. 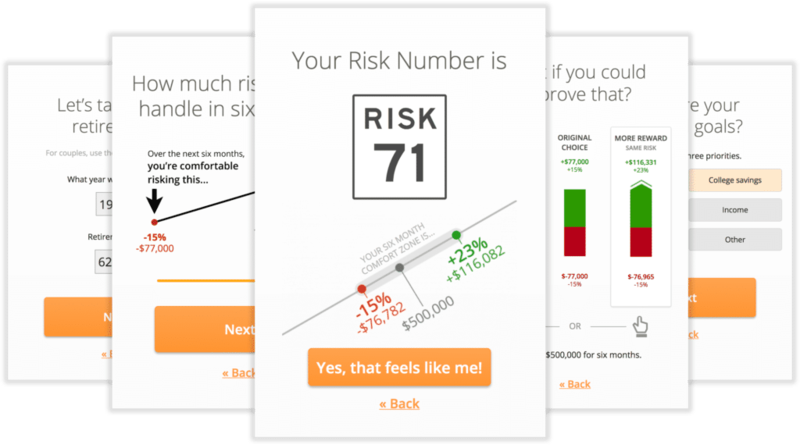 Your risk number ranges from 1-99. The higher the number, the higher your risk tolerance. To calculate this number, we utilize Riskalyze, an integrated program that evaluates portfolio risk with your level of tolerance. Once we have a number for you, we evaluate your current portfolio to see if it matches. If not, we can make some suggestions. The program can even model how your portfolio would perform in different market conditions. From there, we build a portfolio that achieves your goals at an optimal and comfortable risk level for you. Everyone’s risk tolerance is different. That’s why every portfolio we recommend is tailored to you and how conservative or aggressive you want to be. Riskalyze is built on the Prospect Theory that won the Nobel Prize for Economics in 2002 to pinpoint investor risk tolerance and portfolio risk. Take the brief survey to identify your Risk Number®. What if your financial plan and portfolio was tailored to you?